Over the centuries, ivory has not been held in such high esteem as jade by the Chinese. It was used for statuettes, household items and small decorative objects. The demand led to the extinction of China's very own species of elephant around 100 BC. 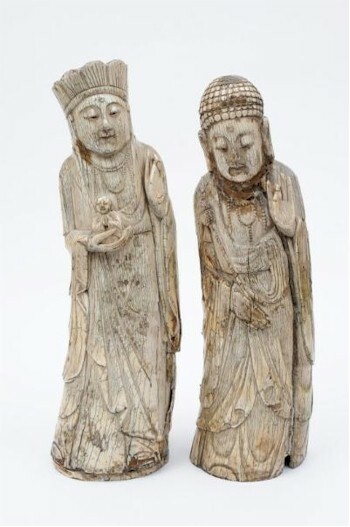 During the Ming dynasty, ivory was mostly used to carve statues of gods and immortals and it was later in the Ching dynasty that carving became more intricate with a greater demand for things such as brush pots and boxes. A 17th Century or Later Chinese Carved Ivory Figure of Kuan-Yin (FS20/804), which is typical of the Chinese Ivory sold in our fine sales. By the 18th century, China had found a ready export market in Europe. Production was prodigious and most was exported through the port of Canton. Highly intricate carved pieces include chess sets (the playing pieces usually dressed in court attire) and fans (which may be carved on both sides of the leaves, usually depicting figures in a garden landscape). Similar decoration was also used in card cases and tusk vases. 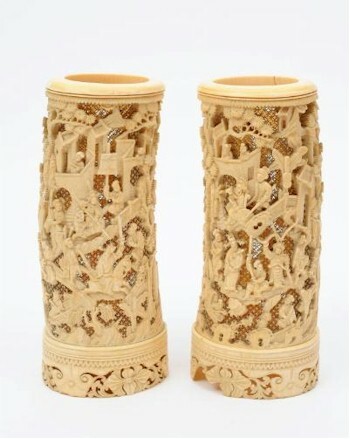 This pair of 19th Century Cantonese Carved Ivory Vases (FS20/806) realised £1,550 in the Works of Art auction of our Autumn 2013 Fine Sale. Perhaps one of the most incredible examples of the ivory carver's skill is the puzzle ball. The ball, with pierced decoration, would contain a series of smaller freely rotating balls inside. This usually came with an ivory stand to place the ball on. There could be up to as many as fifty-four balls contained inside the original ball. A few years ago many of these pieces, such as brise fans and card cases, attracted very little interest. However, with the growth of the Chinese economy, the prices for such items have started to soar. 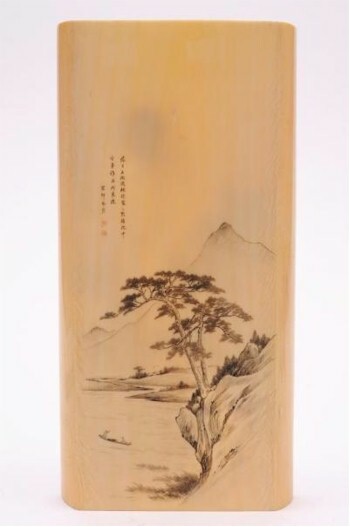 Auction prices for Chinese Ivory are starting to soar: this Chinese carved ivory wristrest (FS20/879) realised £4,900 in October 2013.